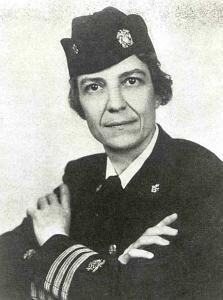 Before 1944, only very few women were accepted into the comissioned corps. Therefore, most PHS female personnel wore civilian clothes. 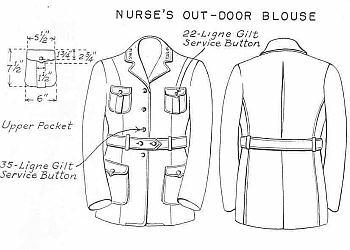 Only the PHS nurses had a special outdoor uniform which consisted of a belted jacket with skirt. The length of the skirt was shortened to follow civilian fashion during the years. 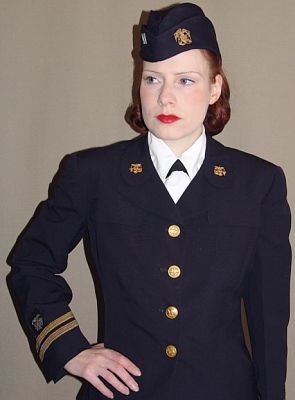 The uniform of the commissioned corps during World War II complied with the uniform worn by United States Coast Guard officers. 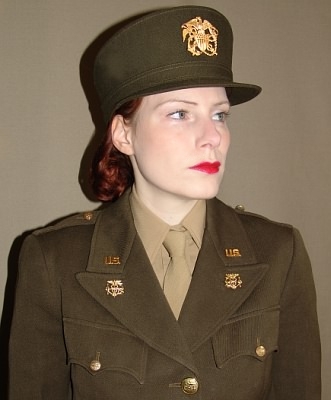 The commissioned corps uniform was worn by all PHS officers throughout World War II, if they were not detailed to armed services or other agencies that required the wear of Army-style uniforms. 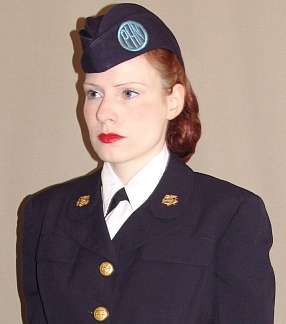 PHS officers detailed to the Navy or Office of Naval Intelligence wore the uniform of the commissioned corps.
. PHS Commissioned Corps Service Dress Blue worn with matching garrison cap. The sleeve stripes and pin-on rank insignia on the cap indicate the grade of senior assistant officer. The Service Dress Blue was worn with a white shirt (short or long-sleeved), black SPARS tie, beige hose and black shoes and white gloves for dress. The envelope-style black SPARS handbag with shoulder straps were optional. 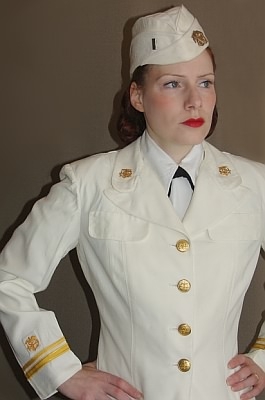 Garrison cap with PHN patch indicating a Public Health Nurse.
. PHS Commissioned Corps Service Dress White worn with matching garrison cap. The sleeve stripes and pin-on rank insignia on the cap indicate the grade of assistant officer. The Service Dress White was worn with a white shirt, black SPARS tie, beige hose and white shoes and white gloves. The black SPARS handbag with white cloth cover (black straps had to be removed) or a white handbag in the same style were optional. 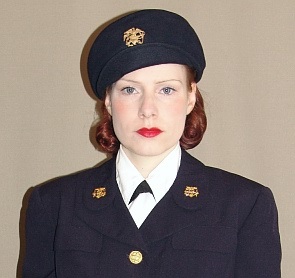 A distinctive white felt beret in the same style as the one for the Service Dress Blue could be worn instead of the white garrison cap.
. During World War II, PHS officers were sometimes detailed to the armed forces and other agencies. PHS officers detailed to the Army, Army Air Forces, Office of Stategic Services, UN or international (i.e., refugee and displaced persons) organizations and in certain other categories (i.e., liaison duty) wore the proper Army-style uniform (that is, nurses wore the Army Nurse Corps uniform and others wore the WAC uniform) modified by substituting PHS buttons, cap device, collar and lapel insignia. 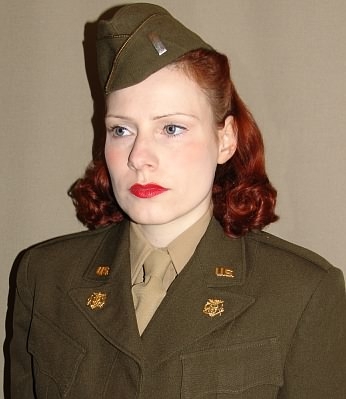 The dark olive-drab service jacket could be worn with a matching skirt or as shown in the picture on the left side with a light shade olive-drab (pink) skirt.
. 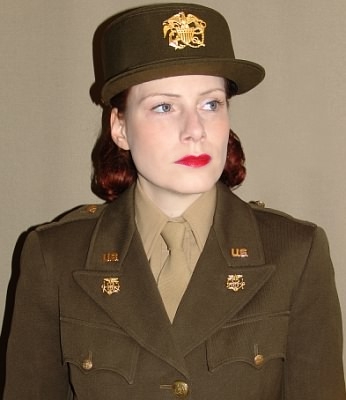 Female Army Personnel serving in the ETO were authorized to wear a battledress jacket with matching skirt or trousers. PHS personnel wore the PHS collar insignia on the lapel instead of the Army Corps branch devices.